The discipline that carries the most competitive and deepest titles. 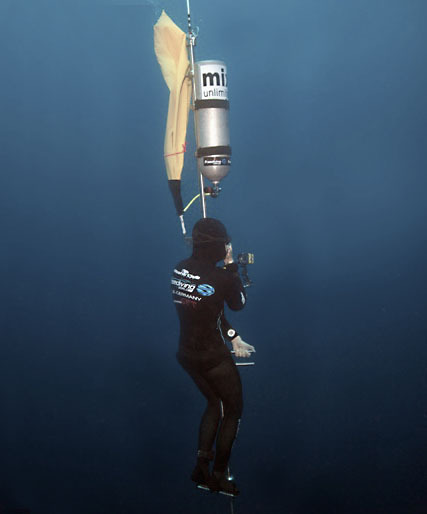 By using a monofin and the body’s own power, the diver's aim is to propel themselves down and back to the surface, without changing their ballast. Seen by many as the purest form of competitive freediving, the diver uses only arms and legs to perform the dive, swimming breaststroke down and back up. A test of upper body strength and endurance, the diver pulls themselves down a weighted line, and back to the surface again. NOTE - all deep competitive dives are ‘constant weight’ - it means we can use weight to assist the descent but must return with the same amount of weight. So a balancing act between an easy descent and an efficient ascent has to be found. Most divers use around 2-3kg depending on their body-size, suit thickness and water type they are diving in. Pure breath-hold. With their face immersed, the diver is aiming for the maximum time under water. Using bi-fins or a monofin the diver swims horizontally as far as possible underwater. Swimming breaststroke horizontally underwater the diver goes for maximum distance, without any propulsion aids. Using a weighted sled to descend as fast and as deep as possible the diver’s main concern is equalising the ears. Not moving means less oxygen is consumed. Extreme depths can be reached and the diver surfaces with the aid of a lift-bag or other lifting device. Using the same sled as NLT to descend. The diver must then get back to the surface using only his own power: either swimming, finning, or pulling on the rope. NOTE – sled dives are not done in competition as the risks are too great. However, divers can set national or world records in these disciplines in specially organised record attempt events.